Bjarke Ingels Listened to Washington, Will He Listen to Tirana? Actors and civil society activists protesting for the preservation of the National Theater. April 9, 2018. 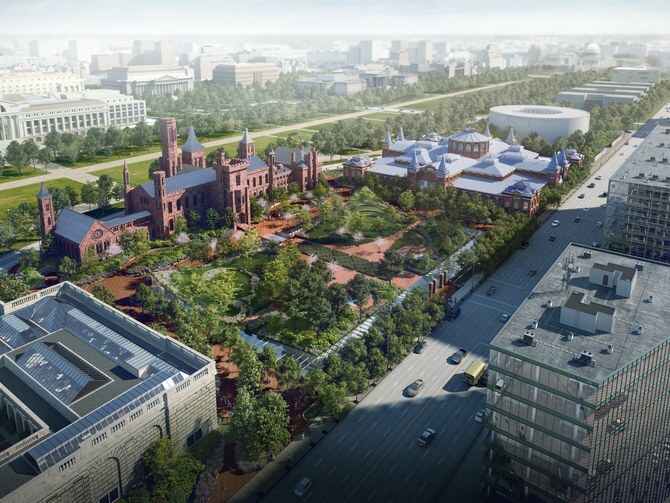 When in 2016 architect Bjarke Ingels of BIG unveiled his plan for the Smithsonian campus in Washington DC, which included the demolition of the beloved public Enid A. Haupt Garden of 1.6 hectares, including its historic gates and walls, an online petition protesting the plans gathered thousands of signatures. The Smithsonian Institution Building or “Castle’s” south entrance, viewed from Independence Avenue. 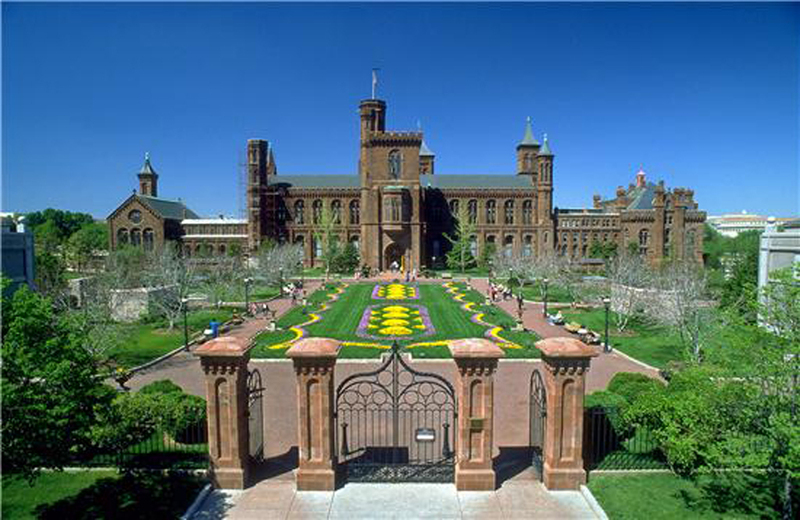 The Enid A. Haupt Garden welcomes visitors through the gates. Photo © Jeff Tinsley. The revisions are an inspiring example of an architect adapting to public interest and cementing a good relationship with the community—gestures that align well with Ingels’s socially conscious attitude toward architecture and urban planning. 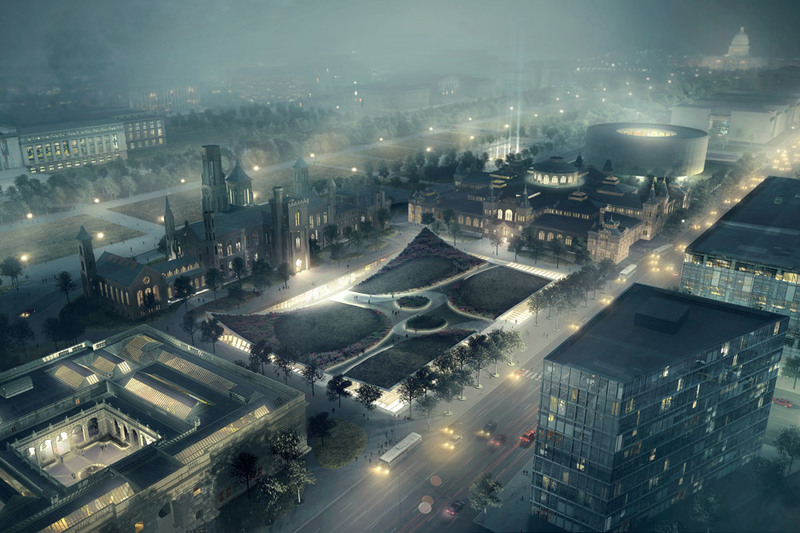 Bjarke Ingels’s proposal for the Smithsonian, 2016. Bjarke Ingels’s proposal for the Smithsonian, 2018. Compared to the 2016 proposal, the historic gates and walls have been preserved, and the landscape design of the garden is closer to current garden layout. “As such,” Keller praises, “the revised master plan bears the difficult burden of toeing the line between preservation and modernization—a balance Ingels is surely qualified to achieve. Recently, BIG proposed another project in a capital city which threatens to erase historical architecture and radically transform a public space. In this case, BIG designed, apparently at the request of a private construction company, Fusha shpk, a new National Theater to be constructed on public land. Apart from the fact that the procedure surrounding this construction project violates public procurement regulations and involves a public–private partnership that has been already sucking millions from the treasury while common citizens are faced with ever increasing taxes and extortionary toll fees, there has been absolutely no dialogue with either those with a direct stake in the project – the directors, actors and visitors of the National Theater – or any consideration of the fact that the National Theater is a historical building, and for that matter much older than the Enid A. Haupt Garden, which dates to 1987. Built during the Italian fascist occupation of Albania, the National Theater complex is of the few remaining landmarks of an architectural period that has thoroughly influenced the Tirana cityscape. But its cultural and historical value is not only tied to its origins. During the communist regime it was also the stage for public show trials in which so-called “enemies of the regime” were put on public trial. This makes the National Theater not only a site of the celebration of Albania’s cultural heritage, but also a site of remembrance – a remembrance that currently is perhaps more necessary than ever, as Albania is slowly but certainly sliding into a renewed autocracy. The destruction of the National Theater under BIG’s plan is therefore not only an erasure of architectural history, but also of one of the few concrete sites of remembrance of the communist regime, situated in the heart of governmental power and next to the abusive, government-sanctioned white-washing Bunk’Art. Ever since Prime Minister Edi Rama presented his plans for the National Theater, which includes transferring a large part of public land on which the current theater building sits to the hands of private developers, actors, artists, and civil society activists have been staging protests, hearings, and meetings surrounding Bjarke Ingels’s project. Concrete plans have been presented by architects of solutions that will preserve the current National Theater building, while expanding and modernizing it, at considerably lower costs for the Albanian tax payer than Rama’s public–private partnership with Fusha. However, in contrast with Washington DC, no representatives of BIG have engaged the Albanian citizens. For the last two weeks, Exit has reached out repeatedly to the press department of BIG, asking them about their planned engagement with the actual stakeholders in their National Theater project. We also asked them whether they are aware of the questionable legal foundation for the privatization of the public property on which their project will be realized. 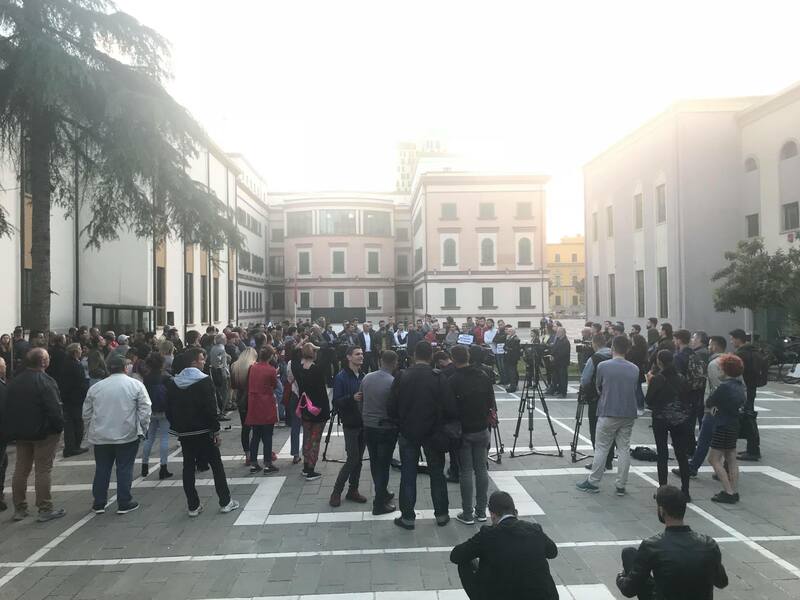 BIG eventually responded they could not answer because of their “contractual agreement” with the Municipality of Tirana, the nature of which remains unknown to the public. So it may well be that in the capital of the US, Bjarke Ingels is an “inspiring example of an architect adapting to public interest and cementing a good relationship with the community” and successfully “toe[s] the line between preservation and modernization,” but in the capital of Albania he turns out to be just another starchitect: oblivious to the social impact of his own work, wanting to make his mark at all cost.